Rajasthan is a state of vast expanse, extensive lakes and desert, which induce an elated sense of freedom. Rajasthan is a place to explore slowly, roaming through the landscapes scattered with crenelated forts, impregnable palaces, shimmering lakes or along the endlessly sand dunes of ever encroaching Thar desert. In cities and towns, too, the pleasures are unhurried: watching and listening to the chat around a blood-orange turf fire. It's the outstanding historical and cultural legacy, combined with Rajasthan's mesmeric natural beauty that makes the state so compelling for the traveller. And once there, few visitors are disappointed by the reality of the stock royal images: the majestic forts, extravagant places, finely carved temples, the easy pace and rhythms of life. What is perhaps more of a surprise is how much variety this western state of India packs into its countryside. Encounters with the people of Rajasthan are at the core of any experience of the state. On the streets of the cities or in the village markets, on trains and buses, the visitor will never be stuck for opportunities for contact: Rajasthani hospitality is legendary. Few places in the world can offer such a wealth of distinctive festivals, folk music and customs, all still going strong in remoter areas of the Rajasthan. Almost any exploration of the villages of rural Rajasthan will be rewarding. 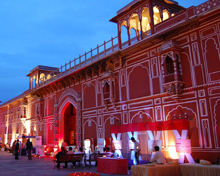 Also known as the "Pink City" thanks to the reddish colourwash applied to its ornate facades and palaces, Jaipur, the capital of Rajasthan, is a foremost travel destination in India. Udaipur, the "White City", attracts tourists for palaces and Lake Pichola. Rajasthan's other primary destination is Jodhpur, the famous the "Blue City," where you can find India's most impressive hilltop fort. 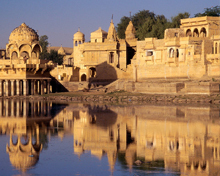 In the further west in the state, Jaisalmer, or "Golden City," is known for camel safari. 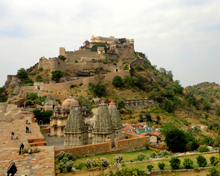 Other than the cities, other corners of Rajasthan are no less frequented. From the lake city of Udaipur you can take a trip to Kumbhalgarh Reserve to visit exquisitely carved Jain temples of Ranakpur and imposing Kumbhalgarh Fort. Rajasthan is also famous for its wildlife sanctuaries. Of these, Ranthambore, where tigers prowls around Rajput ruins and lakeside jungles. Sariska is famous for its serene landscapes and home to tigers. On the eastern border of the state near Agra is the Keoladeo "Ghana"National Park at Bharatpur, which boasts the largest concentration and variety of bird life in Asia. Pushkar is the site of the famous annual camel fair.